This is a Bouvardia cosy...Bouvardia is a multi-coloured yarn from Spotlight, very pretty yarn; the pattern for the basic cosy is below. Decorate with a pom-pom, crochet flowers, or whatever you desire! 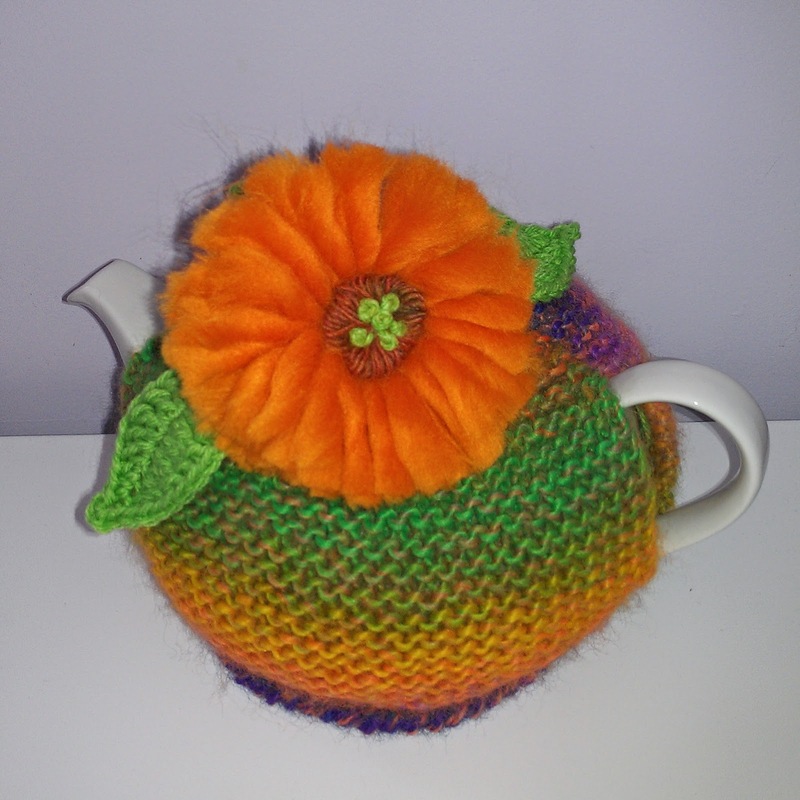 The gerbera pattern is on the 'Gerbera Cosy' tab. 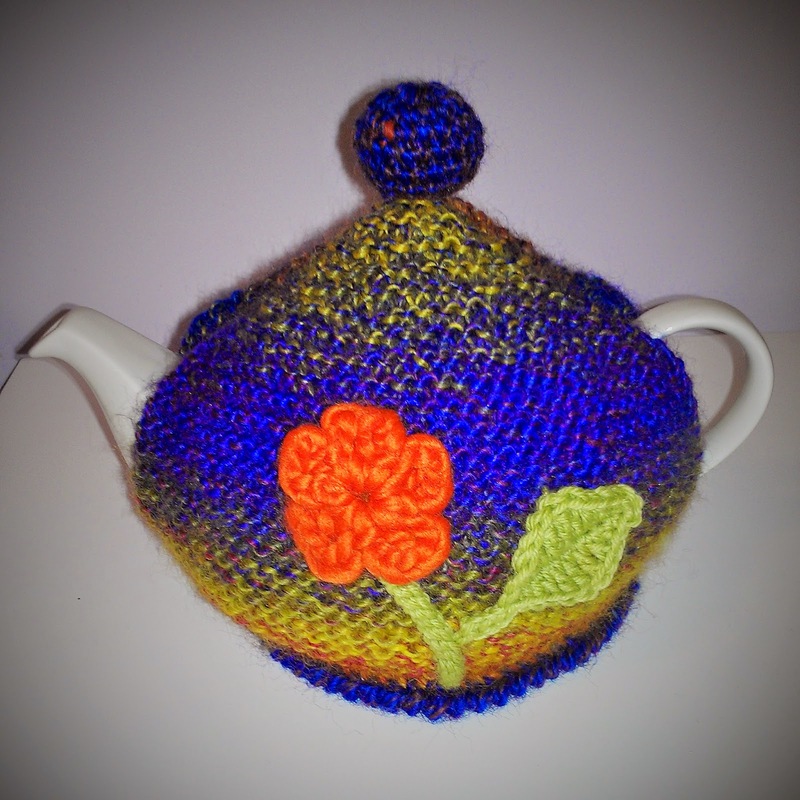 The one immediately above is decorated with some I-cord and crochet flowers. To make the I-cord, cast on 3 stitches on double pointed needles. Knit one row, then push the work to the other end of the needle without turning, and knit the row. Continue this until the desired length is reached; cast off. I've knotted the I-cord and slipped crochet flowers over the knots, and stitched them in place. For the flowers, make 4 chain, slip stitch to form a ring. Work 10 double crochet into the ring. Next row, into every second dc, work 3 chain, 1 treble, 3 chain, ss into same dc. This makes 5 petals. Fasten off and neaten the ends. Today's pattern is for a quick and easy cosy, using Bouvardia, which is one of Spotlight's yarns. 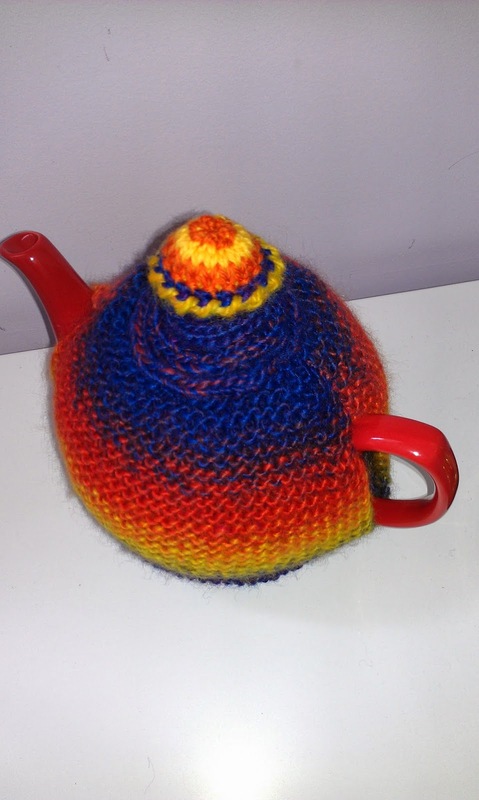 It's nice and thick, comes in quite a lot of bright mixed colours; and because it's thicker than 8 ply, it knits up quickly. 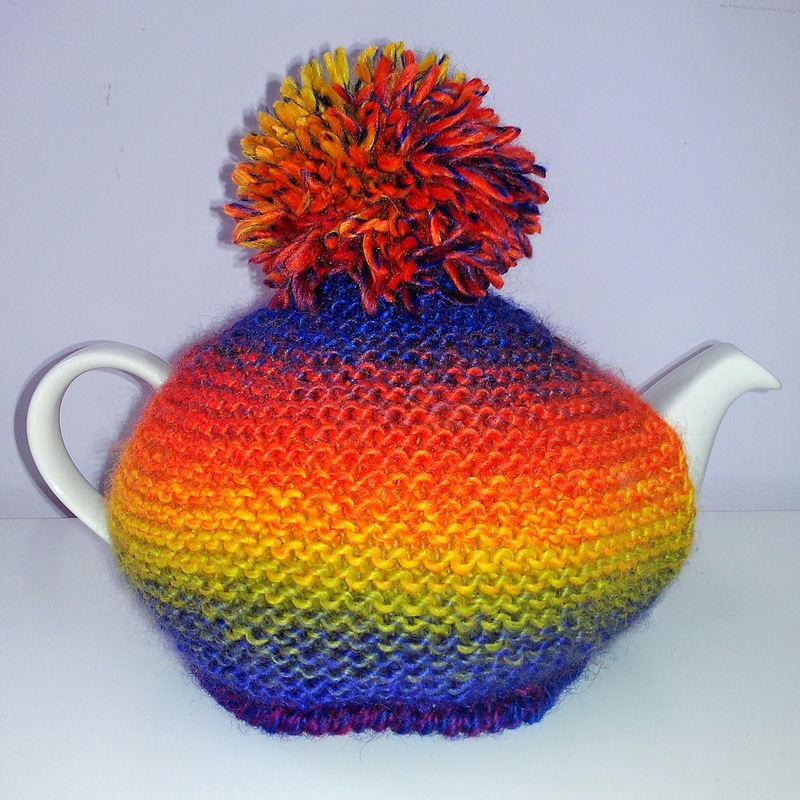 One 100g ball makes 2 tea cosies. 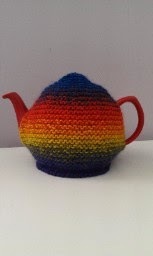 The size...laid flat, the cosy is 23cm wide, and 17cm high; the pot I used holds 1.2 litres of tea. The first photo is the unadorned version; second photo has a strange flower on top of some spiralling I-cord. 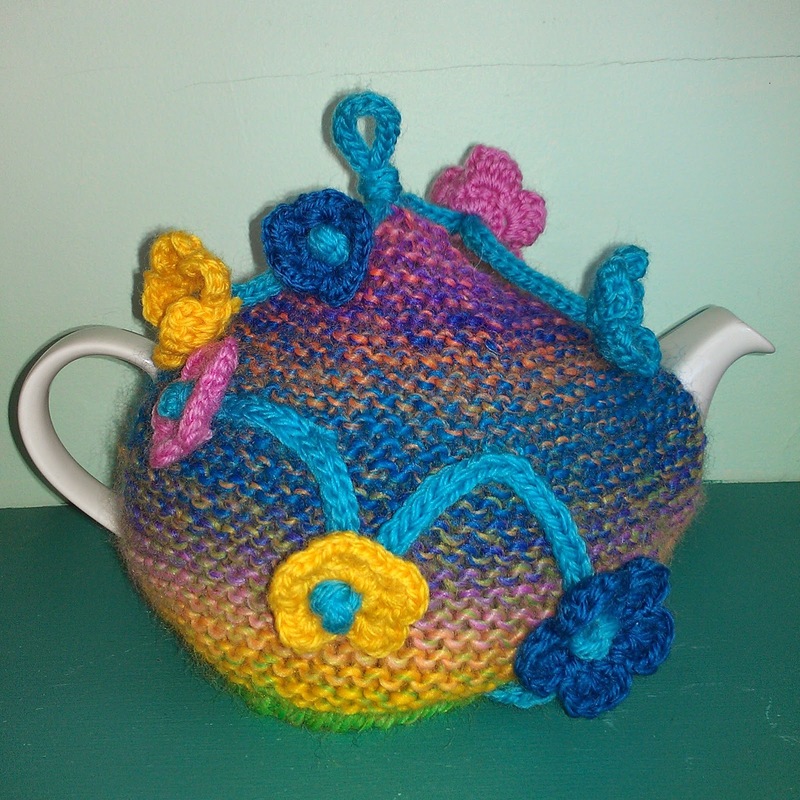 You'll need 50g yarn (half a ball), 2x5.5mm knitting needles; 4mm crochet hook. Cast on 36 stitches, and knit 30 rows. Row 32, and every alternate row, knit. Row 33 Same as row 31. Row 35 k2, k2 tog, k11, k2 tog, k11, k2 tog, k2. Cast off the remaining 6 stitches. Make another piece the same. 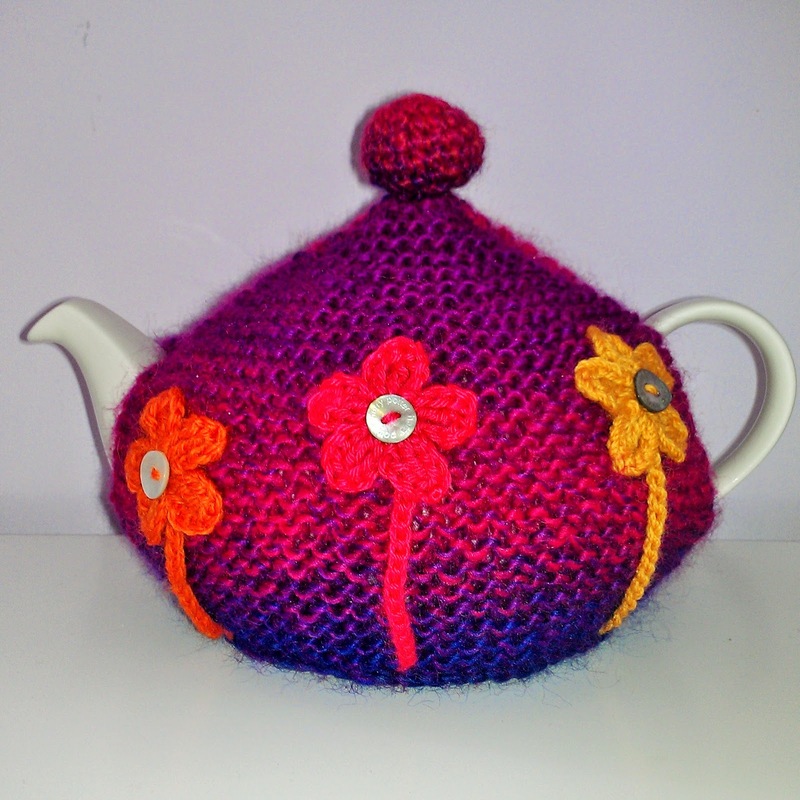 Sew together for 3 cm from the base, then across the top, leaving space for the handle and spout of the teapot. You can leave the lower edge as is, or decorate with a row of double crochet and a row of crab stitch, which is double crochet worked in the opposite direction...this gives a nice effect. 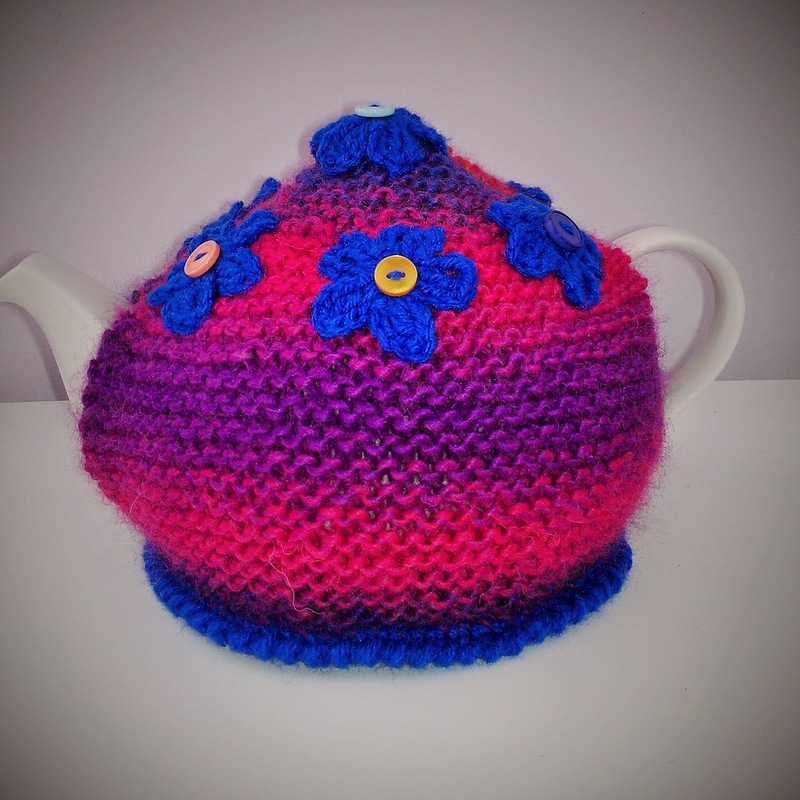 Decorate the top with something that appeals to you...a crochet flower, a pompom, whatever! Use your imagination.